One of the first Sage Summit sessions I ever attended was a session for first-time attendees in 2013. This session, designed for both customers and partners, helped rookie customers and partners navigate the conference. 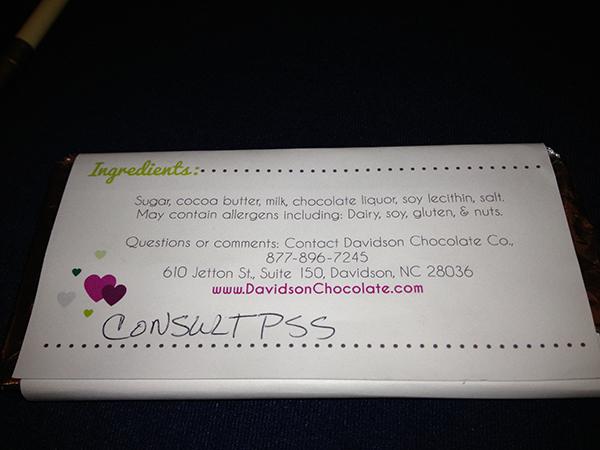 I received this slab of chocolate from Davidson Chocolate Co., a Sage customer from nearby Davidson, N.C., by participating in the Sage Summit first-timers session in 2013. Just like the Sage Inspire Tour session I described last week, this was a informative session mainly because there was quite a bit of audience participation and interaction. Several Sage employees gave tips about using social media (great for learning what’s going on in other sessions), schedules (it’s OK to make changes once you arrive), and sessions (if a session isn’t what you thought it would be, it’s OK to leave before it ends). They also said if you needed help, don’t be afraid to ask a Sage partner or a Sage employee. I pondered that last statement until they opened the floor for Q&A. “How do you balance being helpful with the possibility that someone may think you’re trying to ‘move-in’ on another partner’s customer?” I asked. This really worried me because it would cause one of my greatest joys in life (helping people) to conflict with one of my greatest fears (being misunderstood when doing a good deed). I still remember the looks on the panelists’ faces: knowing looks as if they had expected this question. The answer was simple: Do the right thing. Take it upon yourself to be helpful and not take advantage of a situation, and you’ll have nothing to worry about. Rightly so, they added that if a partner were to cross the line of helpfulness to recruiting, it’s most likely going to be found out. That’s the beauty of events like Sage Summit and the Sage Inspire Tour. 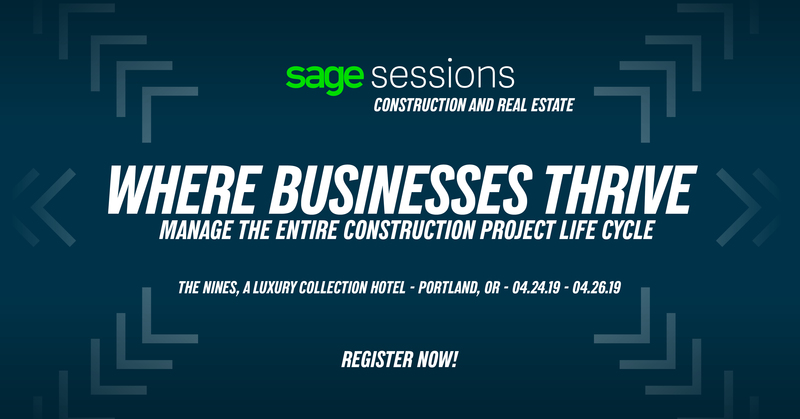 Sage partners can come together to help make these events better for everyone attending. The evening before the Sage Inspire Tour stop in Charlotte, Practical Software Solutions, Accupointe, and Oates & Company — three of the largest Sage ERP partners in the area — hosted a cocktail reception for all of our customers. It was a chance for us to get together for some networking (especially so our customers could be introduced to the Sage representatives who attended). Also, we each give a brief presentation: Sage Mobile Sales, the importance of CRM, and Sage X3 ERP version 7. 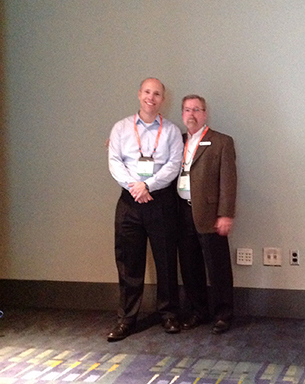 Sage partners Greg Lafferty from Practical Software Solutions (left) and Dene Powell from Accupointe get together for a picture before a session at the Sage Inspire Tour in Charlotte. First of all, we’re not rivals. At least not in that sense. We sometimes — just out of proximity — compete for the same customers. That usually happens when a company knows they’re going to choose a Sage ERP product but not which partner they should choose. But since we all sell the exact same product, sometimes it comes down to which company is a better fit (schedule-wise, personality-wise, distance-wise, or some other variable). Speaking of working on projects, because Accupointe is the creator of the Direct 500, we’ve worked with them many times over the years to provide e-commerce solutions for our customers. And although we haven’t had a chance to work with Oates & Company as closely as we have with Accupointe, that doesn’t mean we would treat them — or their customers — any differently. It really just boils down to the Golden Rule: Do unto others (and their customers) as you would have them do unto you (and your customers). As David Sugg, Practical’s head of implementation, gave his high-level Sage ERP X3 presentation at the reception, there were several audible murmurs of interest around the room. With its web-based, browser-neutral platform and visual process flow diagrams, it presents a stunning contrast to the menu-based system that is Sage 500 ERP. David told me quite a few customers — from all three of our companies — came up to him after his presentation and asked questions. The other partners didn’t have to hover over David, knowing that he would give honest answers and not try to take advantage of the situation. On the flip side, David said when the other companies’ customers asked for more information, he made sure to tell them to speak with their partner. Here’s another example: You may remember in my last post that I said that I stopped to talk to Dene before I sat down for the final session from the Sage Inspire Tour stop. That’s because I needed to let him know that three of his customers were speaking to Linda Cade about some issues they were having with Sage 500 ERP. I had been speaking with Linda after her session on Sage 500 ERP had ended, when these three ladies approached her to ask about some of the things she had been discussing during the session. The conversation turned to some of the issues they were having. “Have you talked to your partner?” I asked. The conversation continued, and I excused myself, because I felt that if I had stayed any longer, it may have looked as if I was trying to take advantage of the situation. They were in Linda’s capable hands, and they were going to speak with their partner. Just like they said at Sage Summit two years prior: I helped the best I could and didn’t overstay my welcome. I found Dene in the main hall and gave him a brief heads-up of what was going on, to which he was grateful. After the event had ended, I found myself speaking with Linda again when Dene came up to us. Almost before “Hello” was out of my mouth, Linda was already explaining to Dene that I was a good partner by advising his customers to talk to their partner. When Sage partners come together like this, it really benefits everyone. Sage customers can see how Sage and its partners can work together to make their experiences much better. They’ll know that when they need help, they can ask anyone, and they’ll be pointed in the right direction. And Sage partners know that we have each other’s backs.